Are you ready for a life-changing week of camp-filled fun and excitement? 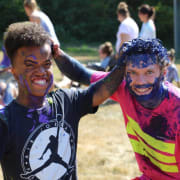 Camp Korey is a nonprofit camp that serves kids with life-altering medical conditions, and we are looking for volunteer week-long counselors to help us give our campers the camp experience of a lifetime! As a Summer Counselor, you will be paired with a cabin to act as their guide to camp! Your job will be to work together with your fellow cabin co-counselors to make sure that camp is a safe environment where everybody who comes to camp can experience joy, growth and healing. This includes taking care of the daily care needs of your campers like keeping them protected from the sun and hydrated. It could also include leading cabin activities like cabin chat or a fun game. So if you're ready to give and receive more love than you can handle, apply to volunteer at Camp Korey!